SolaRoad is being developed in stages. After a technical-economical feasibility study, a first prototype was developed in 2010 and it has been tested extensively in the laboratory. The results raised questions and revealed some points for improvement, but at the same time they were so promising that in 2011 it was decided to further develop SolaRoad. The first milestone is the SolaRoad cycle path near Krommenie as a pilot. 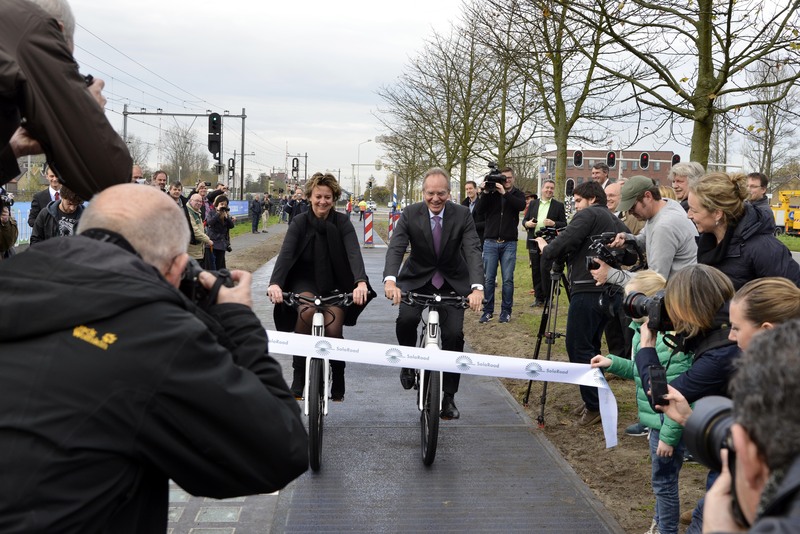 The path was opened on November 12th by Minister Kamp of Economic Affairs and Deputee Elisabeth Post. Simultaneously with the development of the cycle path, R&D projects on specific elements are taking place, as well as laboratory and field experiments. Throughout the project, alternative options are being examined for both the solar cells and the glass. When new developments in the field of solar technology are announced, they will be incorporated in the project. Smart ICT applications should distribute the energy production on days with lots of sunshine as efficiently as possible, in order to compensate for the moments without or with less light. Other potential applications for the generated energy will be investigated during the pilot as well.